Dr. Janet Roberts and Dr. Warren Roberts recently wrote the following article which was published in the Journal of Cosmetic Dentistry. View the full article online (PDF). Drs. Roberts will be presenters at AACD Las Vegas 2017, which will take place April 18-21. Their two courses, about the uses of botulinum toxin in dentistry, will address issues including parafunctional habits, endodontics, TMD/myofascial pain, trigeminal neuralgia, anxiety and depression, and smile design. Cosmetic dental restoration often is not optimal due to extraoral soft tissue conditions that traditionally have been out of the general dentist’s control. Until recently dentists have been confined mainly to intraoral treatment alone. With recent regulatory changes in some jurisdictions it is now possible to use Botulinum Toxin Type A (BoNT/A) to enhance cosmetic dental outcomes. Although the primary cosmetic use of BoNT/A is to treat rhytids around the eyes (crow’s feet) and glabellar frown lines, it is also useful in relaxing other facial muscles to improve symmetry and balance. This article discusses smile design utilizing ceramic restorations and BoNT/A. As dentists we have the opportunity to influence many of the smile’s components, but for many years general dentists have been limited to making changes inside the mouth only (oral soft tissues and teeth). How- ever, with regulations being modified in many jurisdictions, we are now able to effect change to the soft tissue outside the mouth, enhancing the esthetic changes we make intraorally. Recognizing that the lips frame the teeth and gingiva, and the face frames the entire smile, adjunctive esthetic procedures utilizing such modalities as BoNT/A injections allow us to influence the shape of the mouth. With many jurisdictions now including use of BoNT/A injections within the scope of practice of general dentistry it is possible to complete the esthetic treatment of the entire smile. These treatments are a natural adjunct to esthetic dentistry and their use can have a major impact on the esthetic outcome of smile makeovers and comprehensive restorative treatment through their effect on tooth display and the draping of the soft tissue around the mouth (not to mention through muscle relaxation and its effect on temperomandibular dysfunction, headaches,3-6 and implant success). Even dentists who may not be inclined to provide these complementary treatments themselves should understand how BoNT/A could influence the dental treatment they pro- vide and refer to a colleague well trained in its use. The following case report illustrates how the use of BoNT/A in con- junction with cosmetic dental procedures effected a better outcome than traditional cosmetic dental treatment alone. This lip asymmetry made it impossible to achieve one of the major principles of smile design, namely parallelism between the incisal arc of the upper teeth and the curvature of the lower lip. A healthy 38-year-old female presented for treatment desiring a fuller, whiter, and brighter smile, one that was more uniform in appearance without discolored and chipped teeth. Furthermore, she was bothered by the fact that her lower lip €œdrooped€ on the right side when she smiled. Examination revealed aspects of her smile that were less than optimal, including a dental midline that was canted and displaced to the left side. The dental asymmetry was compounded by facial asymmetry; her nose was canted slightly to the right and although her lips were attractive and pleasantly full, the lower lip was also decidedly asymmetrical, dropping much lower on the right side than the left (Figs 1-4). This lip asymmetry made it impossible to achieve one of the major principles of smile design, namely parallelism between the incisal arc of the upper teeth and the curvature of the lower lip.7 The drooping of the lower lip when smiling also accentuated the visibility of black triangles between the lower incisors. Dentally, other concerns included stained and chipped teeth, failing composite bonding that was contributing to gingival inflammation, and gingival recession.8,9 The primary canine was retained in the position of #11 and the upper left permanent canine was congenitally missing. Previous dental history included orthodon- tic treatment with orthognathic surgery and composite bonding to close spaces. A thorough examination was performed and detailed records obtained, including a series of facial rejuvenation photographs (Figs 5-8). This series aids in the diagnosis and treatment planning of facial and dental rejuvenation and also provides an important medical-legal record. It allows the patient to view themself from angles they are unaccustomed to seeing, at rest and with various muscles activated; and helps the dentist to critically analyze the face and demonstrates how the muscles of facial expression affect the smile design. Various options were discussed with the patient, including further orthodontic treatment, porcelain veneers and crowns, implant placement, and cosmetic bonding.11,12 BoNT/A was offered as a means to improve lip symmetry. Eventually a treatment plan was devised13 that addressed both the patient’s esthetic dental concerns and the soft tissue asymmetry of her lips. By addressing both issues it would be possible to obtain attractive teeth with a beautiful frame. 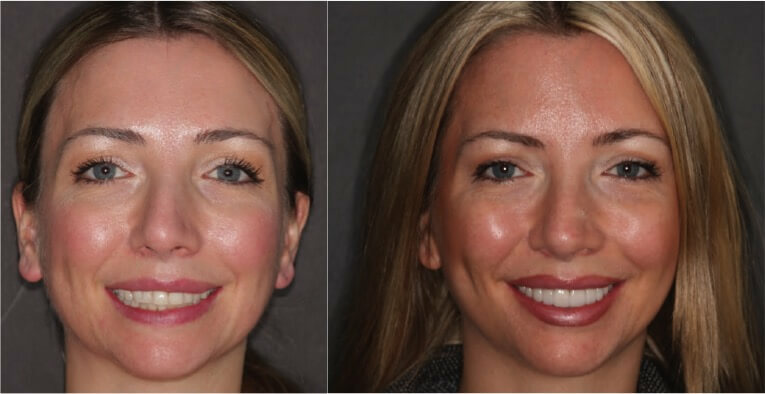 It was decided that 10 porcelain veneers and crowns would be placed on teeth ##4-13 (upper right second bicuspid to upper left second bicuspid) and Botox Cosmetic (Allergan; Irvine, CA) used to relax the downward-pulling muscles that were exerting too great a force on the right side of the lower lip. During the provisional dental phase, the lip position would again be analyzed to determine whether any adjust- ment to the original treatment plan was required prior to final porcelain fabrication. Following preparation of the teeth, impression taking, and obtaining necessary records, the teeth were provisionalized. The provisionals allow the patient to preview the final result and the dentist to work out occlusal details. The patient wanted several changes made to the shape and final shade of the teeth; initially the corners were too round and the incisal embrasures too open. The provisional stage is a critical step in the communication process between the patient and the dentist, and the dentist and the ceramist. The desired changes were made to the provisionals and the details were relayed to the laboratory using photographs, models, and written instructions.19-21 It was apparent at this stage that the lower lip position was still going to detract from the final result. Several weeks later the finished veneers were checked on the models, tried in the mouth, and carefully assessed for fit and es- thetics. The patient gave her consent and the veneers and crowns were bonded into place. After a follow-up appointment for slight occlusal adjustment and checking to ensure no resin tags remained on any margins, the patient was rescheduled to address the lower lip asymmetry. The lips’ appearance following ceramic restoration placement had improved the smile, but the frame around the teeth was still less than ideal. In addition, the black triangles between the lower incisors were still visible, detracting from the overall result (Figs 9 & 10). The rejuvenation photograph series was again obtained to detail the treatment plan for Botox Cosmetic therapy. The series of photographs and the clinical presentation revealed that hyper- contraction of the right depressor labii inferioris, right depressor anguli oris, and right platysma muscles were responsible for the excessive downward pull of the lower lip on the right (Fig 11). Each individual has different muscle recruitment for every facial expression and the recruitment changes with age. If one is performing a true smile design then it is imperative to view the patient in all their various facial expressions. Although in repose the patient’s lips appeared normal, when the muscles were activated it was apparent that all three of the aforementioned mus- cles were overactive on the right (Figs 12-17). The full sagittal views revealed the greater bulk and activity of the right platysma muscle compared to the left side (Figs 16 & 17). Photographing the muscles in repose and activation allowed for precise marking and placement of injections and, therefore, precise results. Two units of Botox were injected into the right depressor labii inferioris, two units into the right depressor anguli oris, two units into five sites on the right side of platysma just below the inferior border of the mandible, and two units into eight sites on the right lateral band of platysma (Figs 18 & 19). The patient understood that this treatment would need to be repeated every three to four months until subconscious activation of the muscles unilaterally gradually diminished. After two weeks (the time required for full results to be ex- pressed with Botox) the patient was rescheduled and the results assessed. Sometimes it is necessary to fine-tune the results with several additional units of the neuromodulator. However, in this case no modication was necessary; the lips were now symmetrical. The smile arc and curvature of the lower lip were coincident and the black triangles between the lower incisors were no longer visible. The draping of the soft tissue harmonized with the teeth to create a smile design incorporating macro, mini, and micro esthetics.22 The final photographs reveal how the use of BoNT/A together with 10 ceramic restorations resulted in a more harmonious smile design than could have been achieved with dental treatment alone (Figs 20-23). The lips’ appearance following ceramic restoration placement had improved the smile, but the frame around the teeth was still less than ideal. Various options were discussed with the patient, including further orthodontic treatment, porcelain veneers and crowns, implant placement, and cosmetic bonding.